The Easy Walk® Harness is designed to gently discourage dogs from pulling while walking on a lead. 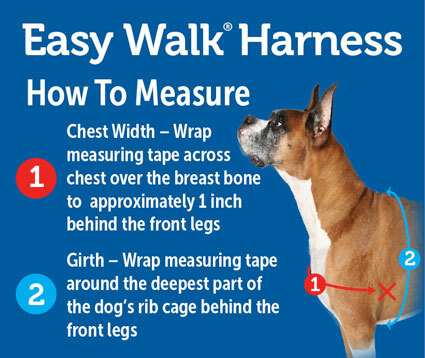 Unlike traditional collars and harnesses, the Easy Walk® does not cause coughing, gagging or choking because the chest strap rests low across the breastbone. The unique front-chest lead attachment stops pulling by steering your dog to the side and redirecting his attention towards you. The quick snap buckles make the harness easy to put on and remove, and 4 adjustment points provide maximum comfort for your dog. The Before You Buy videos are for guidance only and the product names used and range availability will vary by country/region. I bought this in March for my Springer who pulls badly. It's really helped and made walking a pleasure for both of us. I have tried a variety of other well known brands and this harness is definitely the best. The down side is that one of the plastic clips pops open when he is running. I have to take it off if we are playing ball as it flaps around dangerously. It's fine for just walking but I'm now looking to replace as I'm not confident it would stay done up if he pulled suddenly on the lead. Ive tried loosening the harness but then you loose the fit. Otherwise it does exactly what it it says. I have a miniature schnauzer puppy who used to pull like crazy. If we walked him on a collar, he would choke himself and on a back clip harness he would pull REALLY hard. We tried another front clip harness but the chest strap sat very close to the neck so it would choke him just like the collar. We got this harness from our local pet store and it worked! We used along with a six-foot bungee leash (To absorb shock when he lunges) and they worked VERY well together. Along with positive reinforcement training and effort, he now walks nicely without pulling and he no longer chases cars or people. He still lunges at other dogs though. (That is our next project!) I would DEFINITELY recommend this to EVERYONE. However if your dog has short fur or sensitive skin, you may want to choose the Easy Walk Deluxe Harness which has padding for comfort. This is an AWESOME harness! Thank you for your review of our Easy Walk Harness. We are so happy to hear that your miniature schnauzer puppy has learned to walk without pulling, sounds like the harness is doing its job and your puppy is a fast learner! Positive reinforcement and training are so important together with using the correct product. We hope you also get the lunging at other dogs problem under control. Thanks again for your comments! This harness would have got a 5 star review but both my dogs have now got cuts under their arm where the harness have rubbed whilst wearing them on walks. I followed the instructions on how the needed to be fitted and how tightly. I brought the small/medium size for my pug cross breeds and have used them twice. I am so disappointed as they were easy to put on and quick to take off. I would buy the padded version to try but they don't seem to do the between sizes? > PetSafe response: Thank you for your comments on our Easy Walk Harness, Sara. We're sorry to hear that your pug crossbreeds have cuts under their arms. We'll reach out to you to see if we can help you with the correct fit of the harnesses as incorrect fit can lead to chafing. The deluxe version comes in S, M, M/L and L. We will check with you if the small or medium-sized deluxe version may work for your crossbreeds. However, we're glad to hear that you found the harnesses easy to put on and take off. Thank you again for your comments! > PetSafe Response: Hello Ann, thanks for taking the time to give us your feedback. We're glad to hear you'd recommend our Easy Walk Harness and that you find walking your dog so much easier with the harness. It's fantastic to learn that the lives of dogs and their owners can be improved by our products. Thank you again! My dogs used to out all their weights against me and this harness makes them walk perfectly by my side! Made it much easier to train them. Such a good harness!